The late 1970s was an exciting and original time for German cinema. German directors Wim Wenders, Werner Herzog and Rainer Werner Fassbinder gained worldwide acclaim for their original and gritty views of the world. 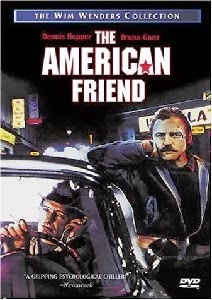 Wim Wenders's "The American Friend" was released in 1977 to mixed reviews. Based on Patricia Highsmith's novel "Ripley's Game," "The American Friend" presents a very different version of the character of Tom Ripley than that of Matt Damon in "The Talented Mr. Ripley." Tom Ripley (Dennis Hopper) brokers paintings by the gifted Derwatt (legendary director Nicholas Ray: Rebel Without a Cause). Dewatt's paintings bring a pretty price because the world thinks he is dead. Ripley transports the paintings to Germany for auction. The paintings bring a good price because they are thought to be lost paintings by the late master. Ripley watches intently as the latest painting is bid on. frames for fine art. Jonathan framed Ripley's latest find. Jonathan doubts the picture's authenticity. Dewatt changed the type of blue paint he always used. No one listens to Jonathan's opinion as he is only a framer. Ripley finds out from the auctioneer that Jonathan has a terminal illness. Soon his wife will be a widow and his son an orphan. Ripley returns to his rented mansion. wants to know if Ripley knows anyone who will commit a murder for money. The wheels start to turn. Ripley thinks of the dying picture framer. A plan is put into motion, which, if successful will allow Jonathan to provide for his family after he is gone. He only has to commit murder. interesting near miss. The film presents a decent man facing a moral crisis. Jonathan is a decent man who loves his family. He also takes great pride in his work. Jonathan finds himself under the manipulative spell of an amoral charmer. Faced with his death, Jonathan must weigh the price of his immortal soul against leaving his family with a large sum of money. Ganz is superb as the conflicted husband. The film presents several mysteries. Is Jonathan really dying? Jonathan keeps hearing rumors that he doesn't have long to live. His doctor tells him otherwise. The scenes between Jonathan and his doctor are charged with tension. Wenders is to be lauded for having such simply staged scenes work so well. Ganz too deserves praise. His seduction by the dark side of human nature is the main reason to watch this film. story takes place after the events in the newer film. Hopper's Ripley has more wear on him than Damon's Ripley. Of course, Ripley is a chameleon, so who knows who the true Ripley is. Hopper plays Ripley as a cowboy hustler. Hopper is dirtier. He is also conflicted. Ripley likes Jonathan. Ripley feels bad for pushing Jonathan through the gates of hell. Jonathan is basically a decent man. It takes time for him to convince himself that he can commit murder. The photography by Robby Muller is outstanding. The film is painted with base colors that evoke the inner moods of the characters. Harsh green, blues and neon reds coat the film with a sense of moral decay. Munich. Wenders and Ganz work so well together. Wender's direction is pulsatingly tense. Ganz communicates so much with body language and facial expressions. Jonathan's innocence and his part in destroying it. "The American Friend" should be seen by any serious film student or fan. Good movie. Great picture. Good sound. Great extras. all of the nuances. Wenders and Muller use light and colors to create a cinematic painting. A beautiful film. The transfer is outstanding. There were a few artifacts that prevented me from giving the picture a "10" rating. There is no pixilation present. There is a noticeable pause between the layers. Great delineation between lights and darks. The colors are rich and well saturated with no bleeding. Crisp picture. There is one grainy scene near the end of the film when Ripley and Jonathan await an attack by the mob. "The American Friend" is presented in three languages at the same time. There are a few French scenes, but the majority of the film switches between English and German. I can't remember a film, which blended so many different languages so well. There is no loss of dialogue. Nice balance between the ranges. The score is composed of an eclectic selection of songs from the 60s and 70s along with Jurgen Kneiper's original material. The music accents Wenders poetic journey to Hell perfectly. Great menu design which embraces the bold color scheme of the movie. Easy to navigate. No Easter Eggs found. The commentary track is one of the best I've heard. Wenders and star Dennis Hopper weave wonderful tales about the making of this movie, and the great cast. Anchor Bay, once again provides the best talent bios in the DVD universe. There are extensive bios for Wenders, Hopper and Ganz. The trailer is interesting. There are 30-minutes of deleted scenes with commentary by Wenders. These provide insight into Wenders's style of directing. There are several extended takes in this collection. There are also several scenes with Nicholas Ray. I'm a die-hard fan of the films of the 70s. "The American Friend" was a major part of the German revolution that took place during the 70s. While Wim Wenders was not the filmmaker that Werner Herzog is, he did a great job with "The American Friend." Ignore the naysayers on this one. "The American Friend" is worth the risk. A rewarding experience for real movie fans.